Winter is comming, days become shorter, need extra visibility for darker times. 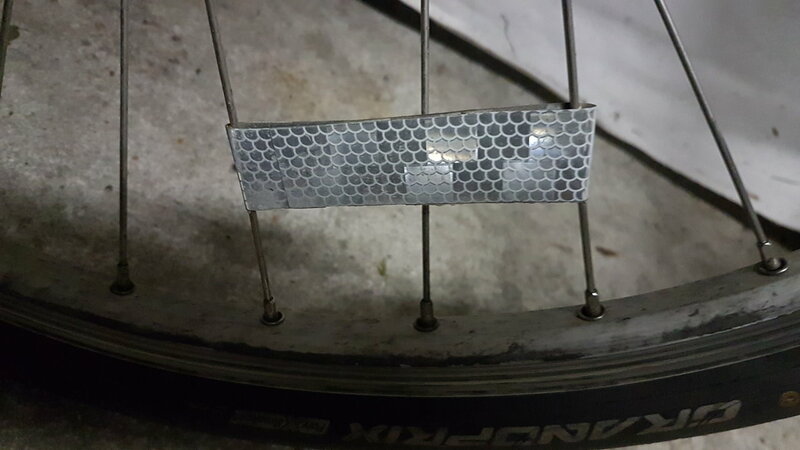 Have somebody used Flectr zero reflector (https://shop.flectr.bike/collections/reflective-products)? Is it worth the money? I can't find any decent review of it. No I've not used those specific ones. However I have used spoke-mounted clip-on reflectors, and consider them far superior to the traditional yellow plastic blobs that adorn many new bikes. Reflectors on the wheel make your bike much more visible from the side. Lights are generally not set up to point sideways, and they have relatively little leakage to the sides. Reflective sidewall tyres are okay, but they're a continuous band and don't have the same movement that revolving spoke protectors have. Pricing? That is for you to decide and we don't really do prices here because the website is global. On looking at the website, they seem to be stickers made of reflective material, similar to whats on a roadcone. Your local craft shop or safety department in a hardware shop probably has rolls of similar reflector tape. Bought them as double-set for under 14 euro (https://shop.flectr.bike/collections/reflective-products/products/flectr-zero-double-pack). Look nice. Not the answer you're looking for? Browse other questions tagged safety protection or ask your own question.